Our New Pure Paté for dogs is naturally healthy and totally irresistible. Made from 100% fresh meat (no offal), these delicious treats are a brilliant single source of protein and are free from gluten and grain. Great for filling Kongs to keep your dog entertained for hours or as a healthy food topper, they’re also ideal as a nutritious training treat. Our New Pure Paté for dogs is naturally healthy and totally irresistible. 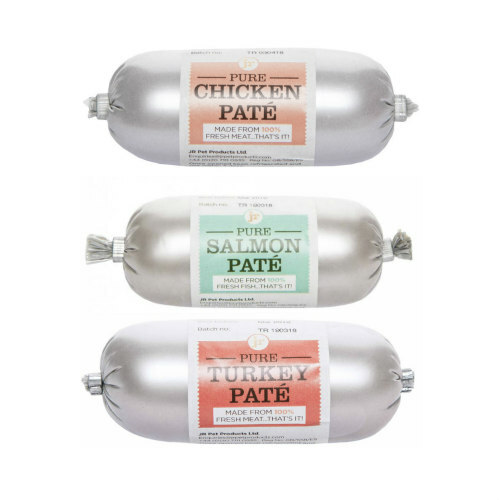 Made from 100% fresh meat with no offal, these delicious treats are also grain and gluten free. So what makes our treats stand out from the crowd? 100% fresh meat/fish (single source protein) – no offal!